Soft-landing the economy -- reining in growth with just enough rate hikes to forestall overheating but not trigger a recession -- was never going to be easy. Ken Matheny, senior economist at IHS Markit’s Macroeconomic Advisers, likens it to a unicorn because it’s so illusive. The Fed arguably has accomplished it only once, in 1994-95, and then it was aided by a productivity surge that stretched the expansion into 2001. The Fed is vulnerable on two fronts. First, the economy is slowing sooner and more than the central bank expected, though Moody’s Analytics chief economist Mark Zandi said that’s partly because of Trump’s confrontational trade tactics. 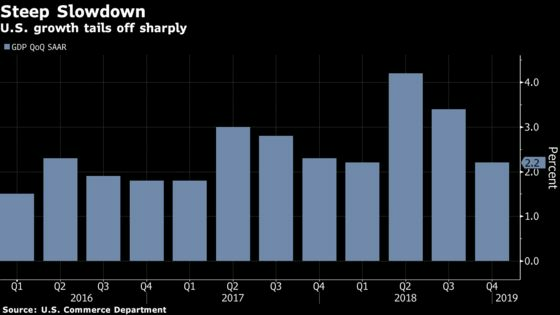 After downshifting to a 2.2 percent annualized pace in the fourth quarter from 3.4 percent in the third, growth is projected to have slowed further in the first quarter -- to 1.5 percent, according to economists’ forecasts compiled by Bloomberg. Activity was weighed down by the since-ended government shutdown and a wobbly global economy. Secondly, inflation has failed to pick up as anticipated -- a development that Trump alluded to in his latest Twitter attack. The personal consumption expenditures price index, the Fed’s favorite inflation gauge, rose 1.4 percent in January from a year earlier and has not been sustainably above its 2 percent target since that objective was introduced in 2012. In another potential pointer to a soft first quarter, U.S. retail sales unexpectedly eased in February on declines in grocery stores and building materials, which could potentially reflect cooler weather, though may also signal further headwinds for the economy. The Fed has responded to lagging growth and inflation by abandoning plans to raise rates at all this year -- a surprise policy U-turn that sparked the first quarter’s stock-market surge. But the administration wants more. Surprisingly quiescent inflation has enabled Trump officials to question the rationale behind the Fed’s soft-landing strategy. If inflation isn’t a problem, why slow growth down? That’s especially the case, they maintain, because the president’s tax cuts and deregulatory actions are boosting productivity and expanding the labor force, allowing the economy to grow faster without generating price pressures. The Fed board’s two vice chairmen -- Richard Clarida and Randal Quarles, both of whom Trump appointed -- seem sympathetic to the argument that the economy has gotten a supply-side boost, though neither subscribe to anything like the administration’s claim of sustained 3 percent growth. They also emphasize different parts of the economic equation. Clarida focuses on muted inflation and the need to ensure that expectations are anchored at the 2 percent target. Quarles zeros in on the potential for faster growth and the possibility that higher interest rates may be needed to keep the economy in equilibrium. “Further increases in the policy rate may be necessary at some point, a stance I believe is consistent with my optimistic view of the economy’s growth potential and momentum,’’ Quarles said in a speech last week, while adding he was “very comfortable’’ with the Fed’s current patient stance in deciding its next move. Fed and administration officials appear to agree that the economic fundamentals are solid. Consumers, whose spending accounts for more than two-thirds of gross domestic product. seem to be doing well, with wages rising thanks to a taut labor market and household wealth up due to surging share prices. What’s worrying the Fed and the administration is weak foreign growth, especially in Europe. Allianz SE chief economic adviser Mohamed El-Erian agrees Europe is a concern, but argues that won’t blow the U.S. expansion off course. 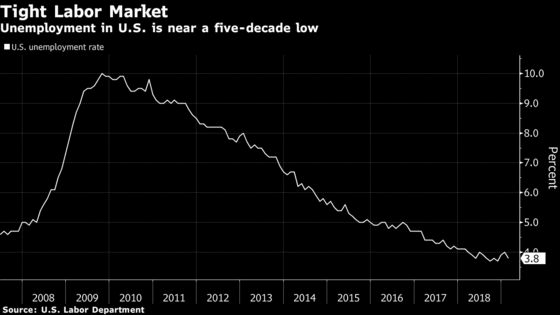 “The only way you get a significant slowdown here is if you get a policy mistake,’’ said El-Erian, who is also a Bloomberg Opinion columnist. But successfully engineering a soft landing and avoiding a recession are unlikely to satisfy Trump as he tries to take credit for a turbo-charged economy heading into the 2020 election.